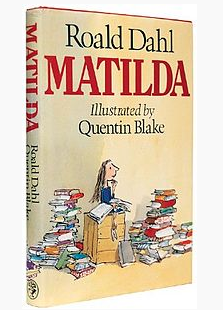 Matilda, by Roald Dahl, was my first favorite book. (Well, maybe second, after Daddy Makes the Best Spaghetti.) My dad read to me every night when I was a kid, and I completely credit my love of words, books, and stories to that ritual. I devoured all of Roald Dahl’s books, and remember my parents trying to hunt down ones I hadn’t read once I blew through the stock at our local bookstore and library. He was the reason I wanted to become a writer. My dad and I read and loved Matilda together, chapter by chapter. (I think it was my first big-kid book.) And now, the show is on Broadway! I hear it’s fantastic, and I’m definitely going to get tickets ASAP!